My third and final "jeanius" project for The Refashioners community challenge is another attempt to replicate a popular style using an unconventional material - specifically a Chanel-inspired boxy, cropped jacket, typically made with tweedy wool, but here made with a pair of men's black denim jeans. 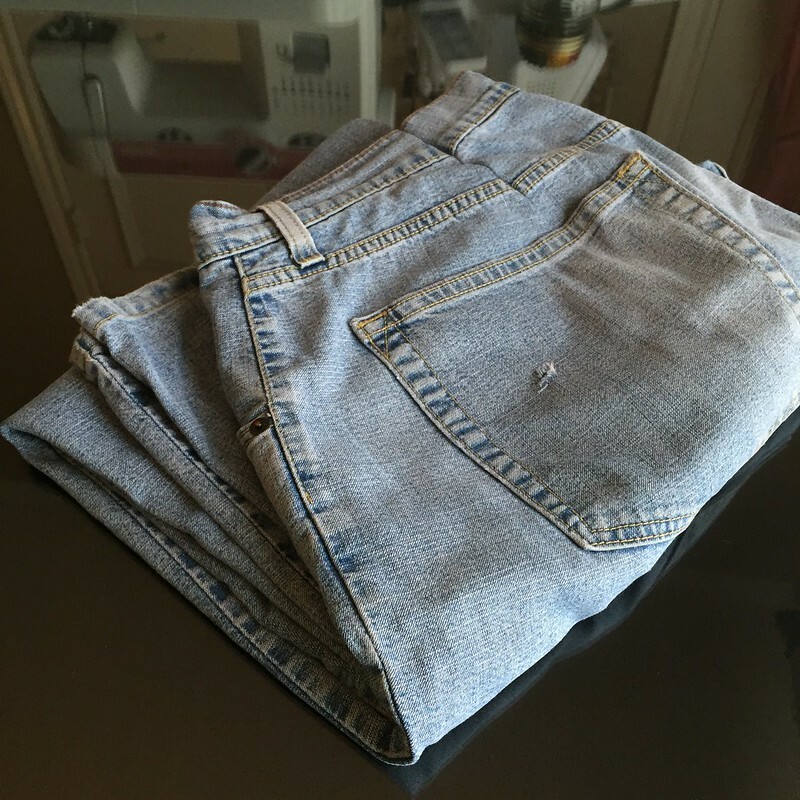 My second "jeanius" refashion for The Refashioners community challenge took a bit longer than anticipated, but it's finally finished! I was pondering the unique qualities of denim and how I could use those in unexpected ways to create something new. For inspiration and - copious amounts of fabric - I was perusing the men's section at Goodwill, when I spotted these rather large, sort of camel-colored jeans. 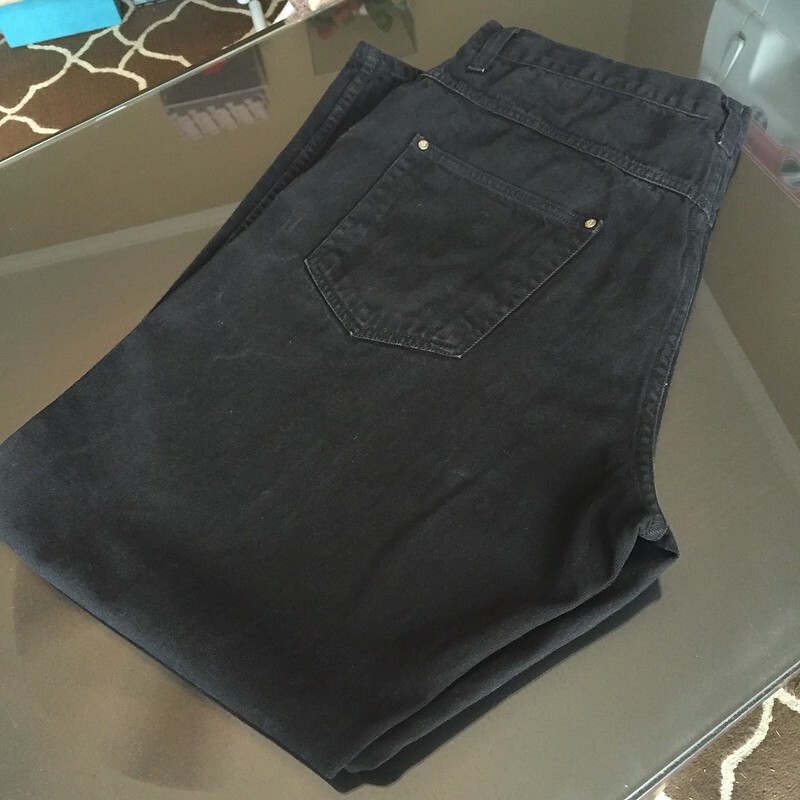 The interesting wash gave these pants an almost suede-like appearance, and thus, an idea was born! A picture began to form in my head of a faux sheepskin vest with these brown jeans as the exterior and lots of frayed white denim (denim chenille, I believe it's called) on the inside to mimic the sheep's wool. 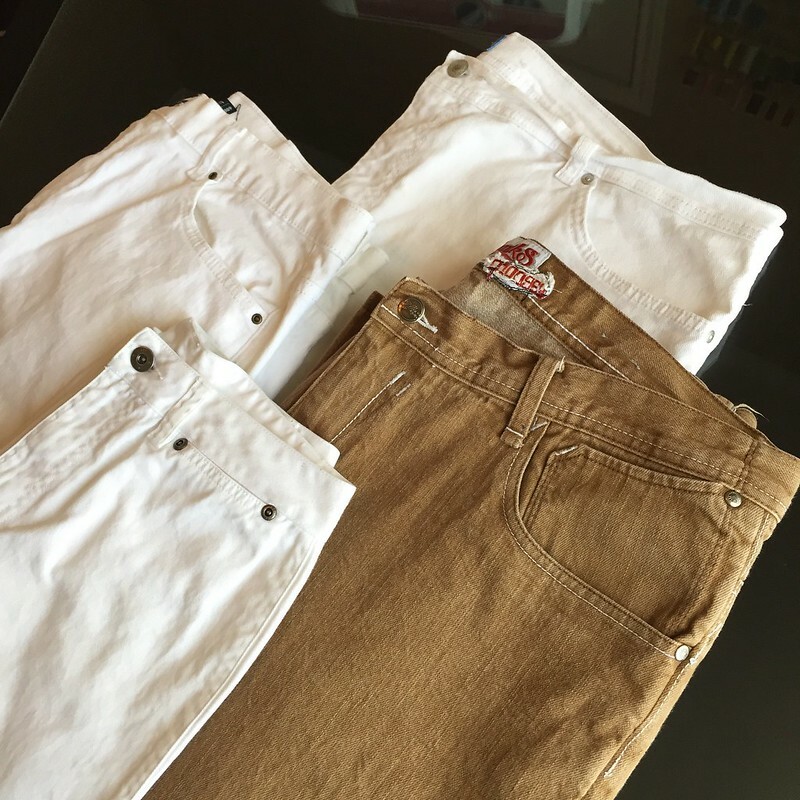 So I grabbed the brown jeans and three pairs of white jeans as well, and headed home to plot out my course of action. 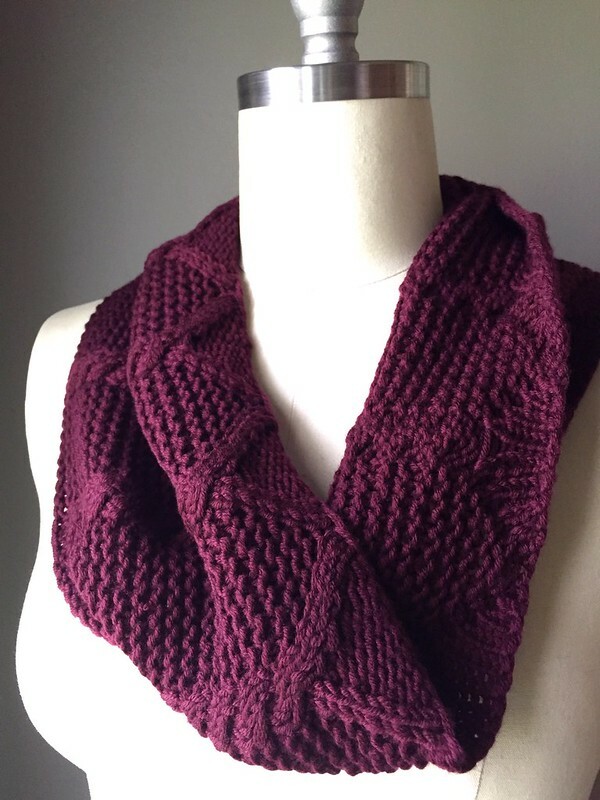 The newest addition to my knitting library is Weekend Wraps: 18 Quick Knit Cowls, Scarves & Shawls by Cecily Glowik MacDonald and Melissa LaBarre. 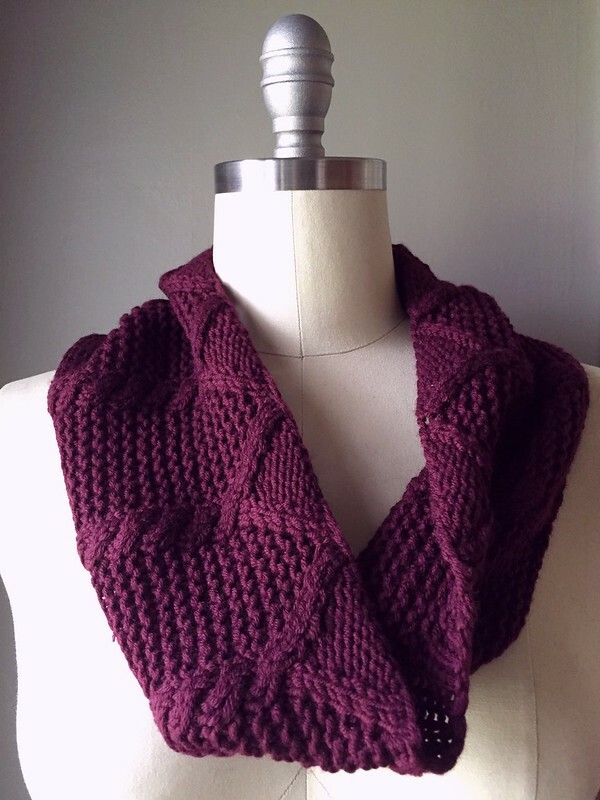 Every pattern inside uses worsted weight or heavier yarn, and most of the designs are smallish accessories that you really can whip up in a weekend. 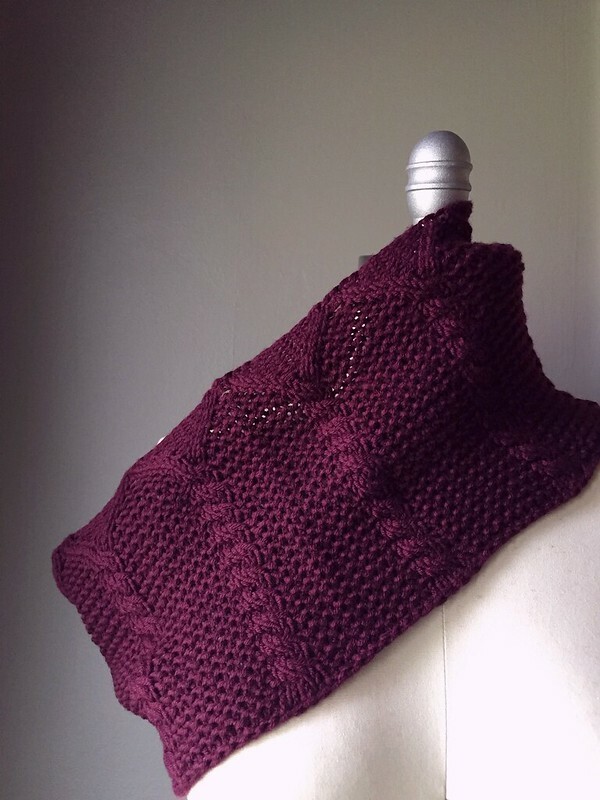 I was particularly drawn to the architectural aspects of Emma Welford's Post & Beam Cowl. I'll always have a soft spot in my heart for cables. They are deceptively simple to create, yet pack a pretty good punch in the final product. I dove into the stash for the required aran weight yarn. 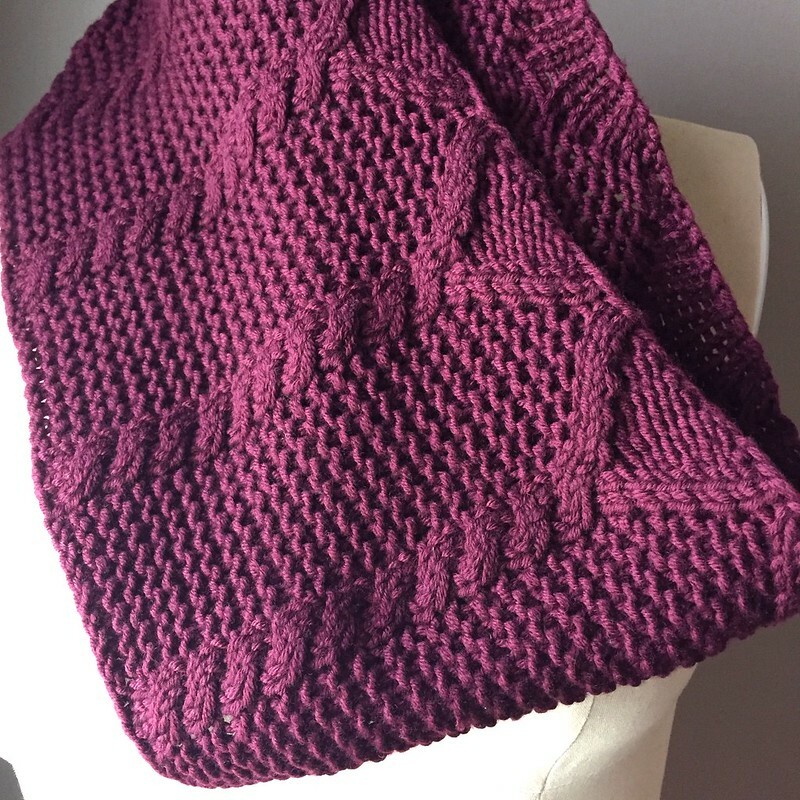 The pattern called for 170 yards, and I just happen to have 176 yards of the discontinued Debbie Bliss Rialto Aran (color #21208) that's been languishing in the stash for, oh, 7 YEARS. It seemed like kismet... until my gauge swatch revealed the Rialto to be a slightly thinner aran than the recommended Quince & Co. Osprey. 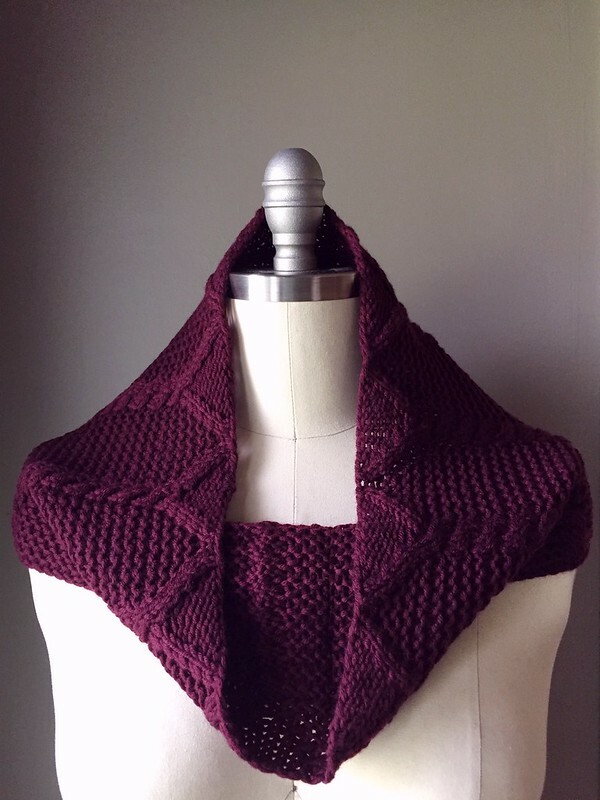 Unphased, I pushed onward, casting on enough extra stitches for a couple more repeats of the cable pattern to keep my cowl roughly the same circumference as intended. Since I was casting on more stitches, I was a little afraid I wouldn't have enough yardage to obtain the correct height, so I flipped the cable chart too. Instead of starting with the posts and finishing with the beams, I began with the beams so I could just make my posts shorter if needed. In the end, I had more than enough yarn. So I just kept knitting until I was about to run out, and then bound off my stitches with the last little bits. It worked out perfectly. First things first - thankyouthankyouthankyou, everyone, for all your support during the Refashion Runway All Stars competition! I couldn't have achieved that silver medal without all of you! 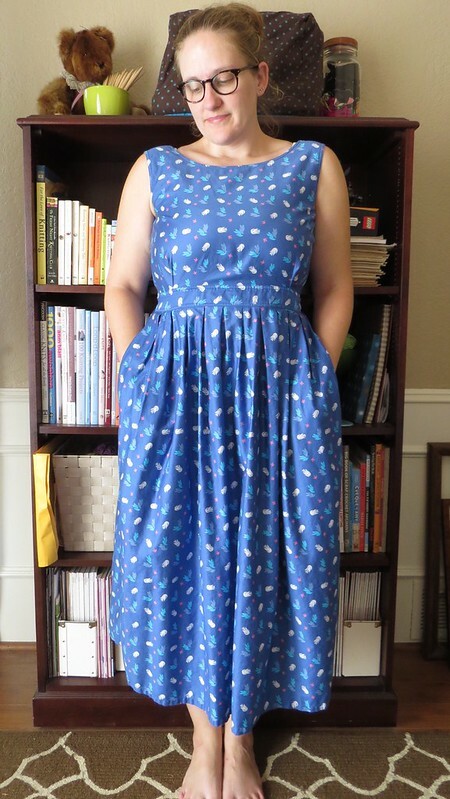 I sort of suspected my sewing muscles would be super sore after that 5-week rigorous refashion regimen, and they were, but surprisingly, not as much as I thought they'd be. My machine and I only needed a couple days apart before we pined for each other's company again. Of course, I had The Refashioners community challenge and Portia's "jeanius" theme to encourage a speedy recovery. After all, I am a Texan. I may hate beans and fried things, but I do love me some denim. Hopefully, I'll have time to complete a few different ideas I have floating around in my head before the September 30 deadline. First up was another tunic. I must admit, that Refashion Runway challenge showed me the light and I am now a total tunic convert! This tunic began with a pair of jeans a friend gave me when they got too big for her. You can see where I added a couple darts for her as she began to lose weight, but soon darts were not enough and she graciously gave them to me for refashioning. Our final challenge for this season of Refashion Runway was Riverside Blue, predicted to be one the hottest colors for fall 2016 by the Pantone Color Institute. Have a look at what I cooked up below, then head over to The Renegade Seamstress to see the other competitors' project and vote for your favorite! I actually had quite a hard time finding something in this blue hue. 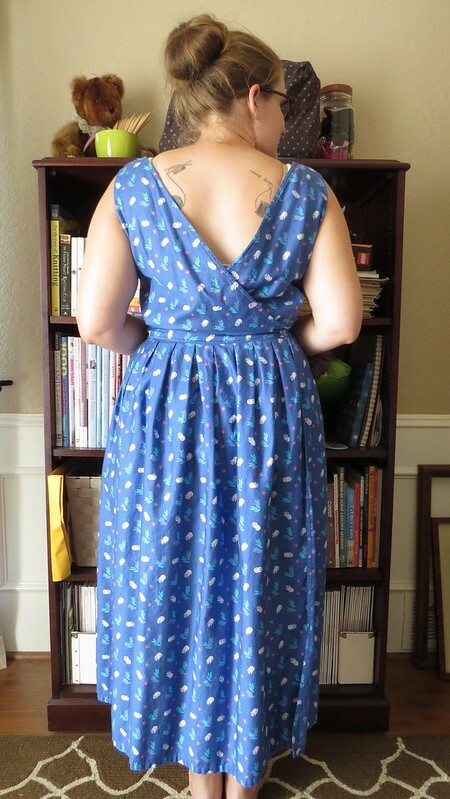 Everything seemed to be too royal blue or too navy or too teal, but eventually I found this 100% cotton wrap dress with just the slightest hint of purple. Just what I was looking for!